Nobody can escape the gradual buildup of wrinkles, scars and spots as they age, or at least that’s what we’re led to believe. While modern medicine can’t halt the aging process completely, it can certainly turn the clock back a few years to give you healthier, suppler and more even-toned skin. Ablative laser skin resurfacing is generally heralded as the more effective technique because it delivers more drastic results when used to correct wrinkles, skin pigmentation and texture issues. However, this is a bit misleading, as non-ablative laser skin resurfacing can be equally effective for patients with different needs. 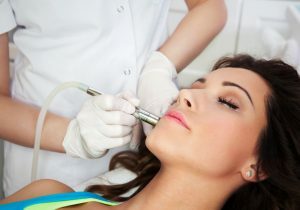 During the ablative procedure, a dermatologist purposefully removes the epidermis, the outermost layer of skin, using either carbon dioxide or erbium laser beams. This process vaporizes the skin that is already aged or damaged. At the same time, the dermis, the layer just beneath the epidermis, tightens for fresher-looking skin. Traditional ablative laser skin resurfacing has a longer two- to four-week recovery period compared with non-ablative procedures. The patient may wish to take a week or two off work until the initial skin damage subsides. However, most patients are ready to return within two weeks and are even able to put on makeup at this time to counteract any remaining redness from the procedure. The skin continues to heal and rebuild itself over the course of months, leading to younger-looking skin that can last for years! By contrast, non-ablative laser skin resurfacing provides more subtle results that may be suitable for younger patients or those with less skin aging or damage. The non-ablative procedure is substantially different from the ablative procedure, as the epidermis is not altered in any way. Instead, the lasers target the dermis to stimulate tightening and collagen growth. Because the top layer of skin isn’t removed, patients tend to experience less redness, swelling and discomfort with the non-ablative procedure and may not need any downtime before returning to work. However, they may need to go in for multiple treatments to see the results they want, and the improvement is likely to be more gradual than with ablative laser skin resurfacing. You may have heard of fractional laser skin resurfacing and wondered how it compares to the ablative and non-ablative procedures. In fact, fractional technology is not separate from these forms of laser skin resurfacing – it is merely a more modern technique that maximizes the effect of surgery. During both fractional ablative and non-ablative laser skin resurfacing, the laser beams are delivered to specific areas of skin rather than the whole face to target problem areas more effectively. This way, the healthy skin surrounding the treated areas can help skin bounce back, quickening the recovery process and delivering more impressive results. If you are unhappy with your damaged or aging skin, restore your confidence with laser skin resurfacing at Virginia Surgical Arts in Virginia Beach. Dr. Sergio Vendetti has dual degrees in both oral maxillofacial surgery and cosmetic surgery, giving him a comprehensive understanding of how to reverse the aging process in the face and leave patients feeling and looking their best. This fractional laser technology marries the benefits of both ablative and non-ablative laser skin resurfacing for the most comfort and best results possible. If you are interested in discussing laser skin resurfacing with Dr. Vendetti, call us at (757) 430-7690 to schedule your first appointment today!